For the Church in Vietnam, this was a major moment of bearing witness that confirms the devotion of the faithful to the Virgin. The leaders of Vietnam's Bishops Conference and Archbishop Leopoldo Girelli were present at the event. The pilgrimage provided an opportunity to revive the missionary commitment based on the theme "Evangelisation of family life." Ho Chi Minh City (AsiaNews/EDA) - Following a well-established tradition, Vietnamese Catholics took part in a recent mass pilgrimage to the shrine of Our Lady of La Vang, a major event that bears witness to the life of the local Church. From 13 to 15 August a crowd of worshipers visited the shrine, the oldest symbol of Marian devotion in all of Vietnam. The first prayer meetings at the Virgin in La Vang, a village in the central province of Quang Tri, dates back to the era of the Tay Son dynasty, in the 18th century. This tradition emerged less than 200 years after the arrival in the Asian country of the first Jesuit missionaries (in 1615 in Hoi An), at least 70 before French colonial rule began. The handful of persecuted faithful who used to visit the shrine to invoke the Virgin's protection have been replaced by today's large crowds (Catholic and others). However, even in the recent past, particularly in the 1970s and 1980s, restrictions on religious freedom imposed by the Communist government after the country's reunification severely limited pilgrimages. Still, over the years, the La Vang shrine has welcomed thousands of people thanks to the heroic and courageous witness of some great figures in the Vietnamese Church, like former archbishop of Hue Mgr Philippe Nguyen Kim Dien, who died in 1988 under house arrest by order of the Communist regime. 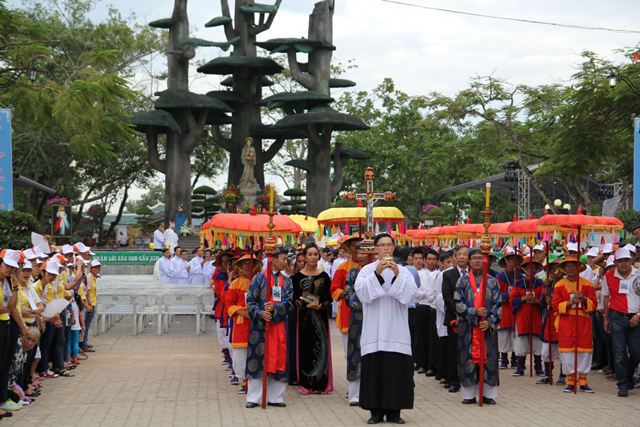 Like other pilgrimages, this one saw more than half a million people trek to La Vang shrine for the three-day celebration. This included a collective bearing witness of faith by the Vietnamese Catholic community, from the representatives of Vietnam's Bishops' Conference, clergy and parishes to the humblest and simplest of the devotees of the Marian cult o. The pilgrimage provided an opportunity to renew the spiritual and missionary commitment of the Vietnamese Church, focused this year on the theme of "Evangelisation of family life." The president and vice-president of the Bishops' Conference, along with five bishops and other religious celebrated the Mass that inaugurated the three-day pilgrimage. The next day, Mgr Leopoldo Girelli, non-permanent representative of the Holy See to Vietnam, celebrated the Vigil Mass along with almost all the bishops. Some 300,000 people took part in the solemn Eucharistic celebration in the morning of 15 August.